With Love From Rachel: bikini ready minus the gym! bikini ready minus the gym! This shot of Britney came out several months back. It was a re-touch of a Candie's ad that she did last fall. The pop-princess was cool enough to remain unfazed by the fact the the world was seeing what her derier really looked like. This makes me love her even more than I did when I was 16.. These pictures got me thinking about my own fear of bikini season. I am not what people would consider overweight - but I also have less and less of a desire to "hit the gym". I am more likely to come home from work exhausted, hit a glass of wine and the bed. That means that though my backside may be small, it is not what one would consider "toned". Luckily, working in the beauty industry for the past decade has taught me a lesson that we should all learn: If you have a skin/body/hair issue, there is a 99% chance that there is a product that will help. I look at going to a pool party the same way that I did going to the prom in the sense that I start preparing a week in advance. I believe firmly that with four steps, anyone can feel better in a bathing suit. 2. Tone: Do not fear. I don't mean at the gym. 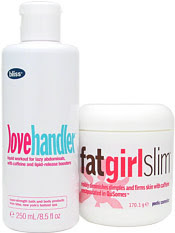 I mean in your bathroom, with Bliss's Anti-Jiggle Duo! This duo smooths the appearance of cellulite and evens out skin tone with ingredients like caffeine and mint oil. I like to use this right after I exfoliate so that the product has the best chance at penetrating the skin and being absorbed. 3. Tan: Umm, not in a bed ladies, or even outside. My (tan) derier would not be caught dead in a tanning bed. 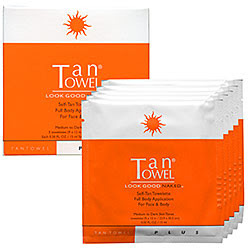 I am obsessed with Tan Towels, the world's greatest at home self-tanner. Open one of these little babies about 20 minutes after you have applied your anti-cellulite treatment and rub yourself down. They are not streaky, work in an hour and leave you with a nice golden color. Love. 4. Oil It Up: Everyone looks better with hydrated skin. The thing I like about using an oil is that a nice sheen can hide imperfections. I love Neutrogena's Sesame Body Oil. It is very light and moisturizing, smells great and doesn't leave you sticky or slimy at all. It also wont break the bank at $9, and can be found in most drugstores. So there it is! My four secret weapons for looking like you have been working at all year in preparation for bikini season (even if you haven't).